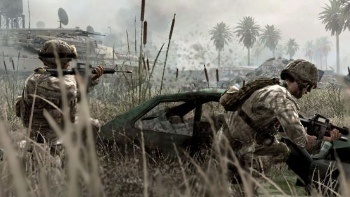 Former Infinity Ward bosses Jason West and Vince Zampella apparently had "very serious discussions" with the publisher. So, quick recap. Jason West and Vince Zampella used to head up Infinity Ward, but got fired after Activision accused them of "scheming" with EA. The pair then formed a new studio - Respawn Entertainment - with seed capital from none other than the publisher it was accused of colluding with. With me so far? Good, because now we have to throw THQ into the mix, as apparently they could have ended up there as well. THQ Core Games VP Danny Bilson says that while West and Zampella ultimately signed with EA, they also held negotiations with THQ: "I probably shouldn't talk about that publicly, but Jason [West] and Vince [Zampella] and I had a lot of very serious conversations during that time when they were 'shopping around'," Bilson said. "We have absolutely hands down the best pitch in the world, [and] the easiest place for artists to come." Bilson said that THQ stipulates that the rights to a title must rest with it rather than the developer however, and if a developer does insist in owning the IP, then THQ doesn't want them: "That's sort of the deal breaker for me ... we have to own the IP... My job coming to this company was to build an IP library, which builds value in THQ. So that means having a developer own the IP becomes a deal-breaker ... I don't need them if that's the deal, and they're not a business I want to be in." Without more details of what went on during the discussions there's no way to determine how things played out. It seems quite likely though, that THQ's policy on intellectual property would have been a sticking point for West and Zampella, as Respawn's retention of the IPs it created was a notable part of its deal with EA.